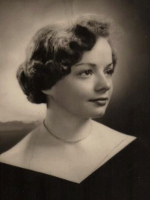 ALBANY – Marjorie A. Berney DuCharme, born May 3, 1934, died February 1, 2011 at her home. The daughter of Benjamin and Mildred McKenna Berney, she grew up in the Bronx, New York. She graduated from the College of New Rochelle in 1956 with a degree in education. Marjorie loved art and enjoyed teaching art to elementary school children. In her free time she took great pleasure in playing the piano, sewing, and painting. Marjorie was a devoted mother and grandmother. She was predeceased by her husband of 51 years, Francis C. DuCharme, and by her daughter in law Anne DuCharme. She is survived by her children Jane Wingle (Ronald) of Albany, Mary Ann Matters (Rick) of East Greenbush, Peter DuCharme of Altamont, John DuCharme (Ann Marie McGuire DuCharme) of Rexford, Paul DuCharme (Marianne Franze DuCharme) of Los Gatos, CA, and Helen Matz (William) of Latham; her sister Cecelia Dougherty of Ormond Beach, FL; her grandchildren Amanda, Katrina, and Rebecca Wingle, Amber DuCharme, Gregory and Alexa DuCharme, Adam, Evan and Jake DuCharme, and William, Benjamin, and Joshua Matz; and by several nieces and nephews. Funeral services will be held in the Hans Funeral Home, 1088 Western Ave., Albany, Saturday morning at 8:15, and from there to the Parish of Mater Christi (formerly St. Catherine of Siena Church), Hurst Ave., Albany at 9:00. Relatives and friends are invited, and may call at the funeral home Friday from 4-7 p.m. Interment will be in Our Lady of Angels Cemetery, Colonie. In lieu of flowers, memorial contributions may be made to the Marjorie Doyle Rockwell Center, 421 Columbia St., Cohoes, NY 12047; or Bright Horizons at Carondelet, 385 Watervliet-Shaker Rd., Latham, NY 12110; or Mater Christi School, 35 Hurst Ave., Albany, NY 12208. To leave a message of condolence for the family, send a sympathy card, or obtain directions to the funeral home, please visit www.HansFuneralHome.com. You have our condolences and sympathies at this time for the passing of Marjorie DuCharme. It is never easy to lose a parent no matter when it should occur. Our memories of the person on birthdays and holidays are the ones that we should keep of how a life was lived and enjoyed. Greg and Alexa have been able to enjoy her company for many years of their lives and thus have an ability to share her memory with their spouses and family and therefore be able to keep her values and pass them on to future generations. Our best wishes go out to you and we will always have those hockey road trips to remember. My deepest sympathy goes out to you and your family during this difficult time. You will all be in my thoughts and prayers. I am so sorry to learn of your mothers passing. I remember her as kind, warm, always smiling, and ALWAYS supporting her kids! I bet many kids growing up with us, wished they had a mother like her. I was saddened to read of Marge’s passing. Marge and Frank lived upstairs from my family on Warren Street when my parents had their flat. I would come upstairs and visit with Marge and Frank-I would sit on the back stairs and say hi to Jane, Mary Anne and Peter. Marge was so patient with a nine year old girl who was delighted to be included in your family space. Both your parents were lovely. My sincere condolences to your family for your loss. To the good people at Hans Funeral Home, I would like to thank you for the kind and caring way you helped to send my mother to her eternal resting place. All things considered, I never dreamed she would look so beautiful. In addition to that, she truly looked at peace. You made the wake and funeral experience comfortable for our family and friends. You did a wonderful job and I cannot thank you enough.